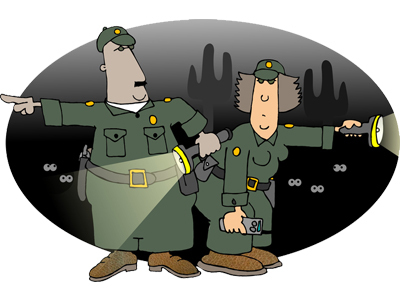 How to Become a Border Patrol Agent? Border Patrol Agents (BPAs) are law enforcement personnel who ensure that people and goods travelling into the US are in accordance with the law. The main area where their work is concentrated includes the borders of Mexico and Canada, as well as the coastal waters of Puerto Rico and Florida. Border Patrol Agents are responsible for controlling illegal immigration and defending the American people against terrorism, agricultural pests, drugs and human trafficking. If you want to become a border patrol agent, here is all the information that you would need. Before you get into the educational and professional qualifications required to become a border patrol agent, you need to meet a few basic qualification requirements. Border Patrol Agents should ideally posses a bachelor’s degree in any field. Even though entry-level jobs in the field don’t require a postsecondary degree, getting one may result in a better salary package. Typical entry level agents are hired at the GS-5, GS-7 and GS-9 levels. The higher levels get a greater salary. For these higher levels, you must have relevant job experience or a postgraduate degree in the relevant field. Alternatively, you can qualify for a BPA position through a combination of education and work experience. As a general principle, each year of full-time education would get counted as three months of general work experience. However, if you have any work experience where the difficulty level was more or equal to that of a federal grade GS-4, you do not need a college degree. According to the US Customs and Border Protection, you do not need to get an education in a specific degree, although doing so might put you at an advantage. Your experience should demonstrate your skills in management, decision making and maintaining composure in high pressure situations. In addition to extensive training in laws, aspiring BPAs will also receive physical and firearms training. The job of a BPA would require you to be in perfect shape and capable of performing high intensity duties. Specific requirements include having good vision and good hearing, along with passing three specific physical exams. Other physical requirements include running 1.5 miles in 13 minutes or less and completing an obstacle course in 150 seconds or less. To check the complete set of requirements, you are advised to get in touch with the US Customs and Border Protection personnel. They can provide you with a detailed set of requirements you will need to meet to become a BPA.